The third season of Once Upon A Time (Sundays at 8PM on ABC) puts a lot of focus on Henry (Jared Gilmore) as he has been a captive of Peter Pan and the Lost Boys in Neverland, unaware that his very large family is there, too, trying to find him. We spoke with 13-year-old Jared Gilmore at OUAT’s Vancouver studio recently about what Season 3 has been like for him — starting with the part of the new year that he is liking the most. “For me, my favorite part would be getting to work with Peter Pan and all of the Lost Boys. It’s different for me, working with all these people that are more my age, rather than Jennifer and Ginnifer who are older than me,” he admits. “It’s nice having kid friends, or younger friends to work with.” This new friendship for Jared’s character of Henry means he gets to do some cool things — including flying, in the season premiere. 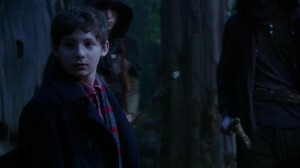 “Pan says magic is dying, and he needs Henry to save magic from dying, because magic is fading away. In Neverland, things are dying, people are getting older, even though they’re not supposed to… so, he needs Henry to save magic,” he continues. Could Henry have magic inside him too? “I think Henry is magical himself, well, being his bloodline, his family, and also the fact that he has so much belief makes him magical,” Jared answers. 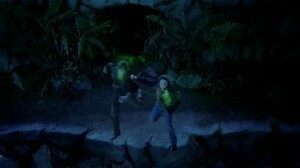 As Season 3 progresses, it is possible that the relationship will change between Henry and Peter Pan. At first, he doesn’t like Pan,” Jared says. “He doesn’t trust him, but I think over the next couple episodes, Henry will slowly start to trust Pan, and begin to like him, and eventually come to the point where he doesn’t know if his family is coming to save him, and he eventually thinks this could be his new home if they’re not coming. He starts making friends with the Lost Boys and Pan,” he explains, confirming that in a way, Henry is becoming a Lost Boy himself, because he’s lost. “He’s away from home. He doesn’t know if his family’s coming to find him,” he says.